This is what I get when I run CDVD full or fast for the iso. Specs are i5-3570k and 660ti, latest drivers, directx, and c++ distributed. Running the bios works fine. I'm sorry if I'm reviving a thread that's been inactive for a while. I am having the same problem, was any fix found to this? (02-01-2013, 07:07 AM)Lexaus Wrote: I'm sorry if I'm reviving a thread that's been inactive for a while. I am having the same problem, was any fix found to this? Did you install DirectX? 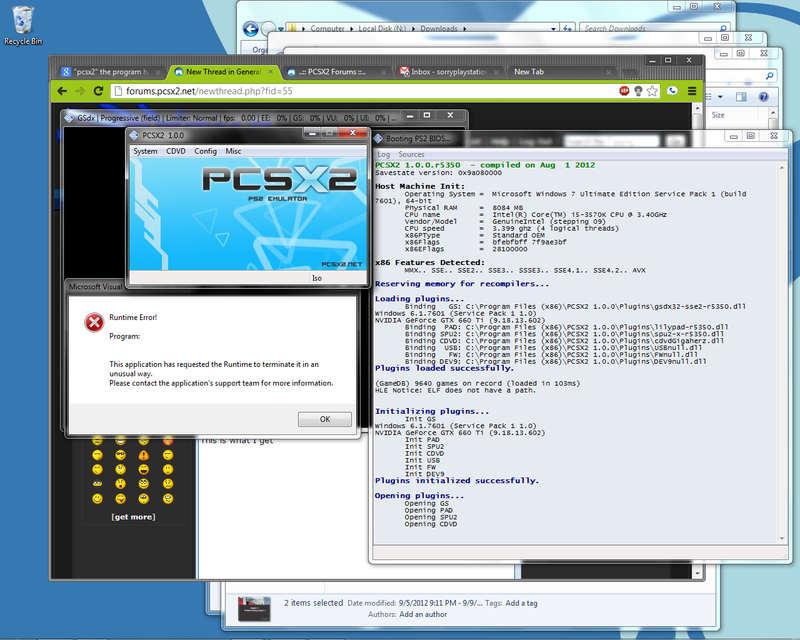 PCSX2 needs the last version from MS, the versions which comes with the OS or installed by games are outdated. Second, did you make the same mistake the OP did that is installing PCSX2 under C:\Program Files or ...x(86)? if so move it to a folder yourself create, something like C:\PCSX2 for example, or even and preferably another partition/disc like D:\PCSX2 E:\PCSX2 if available. If you mean the exact problem from this thread then it's a vs problem not dx nor priviledges related, just install this(yes you need it even if your system is 64 bit;p). looks like you have your iso mounted, please unmount it first. Oooh thank you all for the responses! (02-01-2013, 08:43 AM)nosisab Ken Keleh Wrote: Did you install DirectX? PCSX2 needs the last version from MS, the versions which comes with the OS or installed by games are outdated. Yeah, my directX is as up to date as it can be according to the installer. It's a pretty old system so I'm pretty sure it can't take the newest versions of DirectX. (02-01-2013, 10:25 AM)miseru99 Wrote: If you mean the exact problem from this thread then it's a vs problem not dx nor priviledges related, just install this(yes you need it even if your system is 64 bit;p). I did install that, and my system is 32 bit. I'm afraid it didn't change anything for me, I don't even particularly know what it is. I didn't actually. I don't believe I've downloaded any dll files or anything like that. (02-01-2013, 11:54 AM)refraction Wrote: looks like you have your iso mounted, please unmount it first. Interesting! It could be an iso problem because I only get this error message when I try to run an iso on a new SVN. if you have the disk inserted in the virtual drive (daemontool as an example) then pcsx2 can be a bit bitchy about that, go to start and then go to computer and see if you have any other dvd/virtual drives active and if so, rightclick on the virtual drive and select unmount iso. i asume you made the iso from your original disk through imageburn? Hmm. Alright, starting to make some sense! I'll try this daemontools thing and try to do what you said there. Mhmmm I did use imageburn. Does that make a difference? Hmm I don't believe I have anything mounted in the virtual drive according to daemon tools. Current time: 04-24-2019, 02:47 PM Powered By MyBB, © 2002-2019 MyBB Group.